While some automakers have plenty of expertise in electric powertrains, others haven't entered the realm. Bosch is hoping automakers will see past developing their own electric powertrain technology and fancy a ready-to-use unit instead. The automotive supplier has revealed its off-the-shelf solution for electric cars that can be applied to numerous vehicle applications. Bosch's mobility solutions chief Dr. Rolf Bulander says the so-called "e-axle" combines the motor, transmission, and power control electronics all in one. It does not include the battery or software, which would have to be sourced or developed by the automaker. This electric powertrain delivers between 67 and 402 horsepower and can be fitted to city cars, sedans, SUVs, and even light trucks. Bosch expects the electric powertrain to produce 738 pound-feet of torque in some applications as well. There's also the potential for automakers to simply source the unit as supplemental power for a plug-in hybrid vehicle. Or, to take it a step further, the electric motor could be attached to a performance application for future hybrid sports cars. Bosch describes the e-axle as a "start-up" for those looking to expand into electrified powertrains. The company thinks its electric powertrain could save some automakers and other companies substantial amounts of money in developing their own solutions. Bosch has been working with electric and plug-in cars for years now, and has therefore gathered a wealth of knowledge surrounding the powertrain. Production of the electric powertrain is planned for some time in 2019 at the latest. global: First in (Electro-)Ecology? ...in the U.S? What’s the State of Electric Vehicle Market Share in America? ...The car that truly attempted to bring electric cars into the mainstream was the 2011 Nissan Leaf. U.S. Leaf sales, never reaching any great heights, plunged after its fourth full model year, falling by more than half between 2014 and 2016. Perspective? Ford grew its F-Series’ share of the overall U.S. new vehicle market from 4.5 percent to 5.1 percent during the same period. It’s not that EV sales aren’t rising. Clearly, to increase their share of the market — propelled along by government tax credits that will likely expire for many automakers in 2018 — from 0.1 percent in 2012 to 0.5 percent in 2017 requires a meaningful increase in actual sales. After all, the market at large has grown, as well. According to HybridCars.com, a vital source for this post’s EV sales data, fewer than 14,000 pure battery-powered cars were sold in 2012: Nissan Leafs, Tesla Model Ss, Smart Fortwo EDs, Ford Focus Electrics, Honda Fit EVs, Mitsubishi i-MiEVs, and Toyota RAv4 EVs. Tesla Model S Grey - Image: TeslaBut after growing by leaps and bounds in 2013, growth powered largely by the Leaf and Model S, the rate of growth has markedly slowed. EV sales more than tripled in 2013, as did EV market share. But the year-over-year increase in 2014 was down to 33 percent despite four additional nameplates. In 2015, EV sales were only 5 percent stronger than in 2014. Then 2016’s EV sales rose 18 percent, even though the fleet didn’t add to its number of nameplates. The rate of growth in 2017, with 16 different nameplates collecting U.S. sales in the first two-thirds of the year, stands at a similar 21 percent. Granted, that is growth in a market that’s experiencing decline. But the total numbers are so small, they can be compared with individual nameplates such as the Honda Odyssey, Lexus RX, Honda HR-V, Subaru Crosstrek, Chevrolet Tahoe, and Dodge Charger. Indeed, vehicles that wouldn’t be widely considered marketplace hits — the Dodge Journey and Kia Forte — generate significantly more volume than America’s entire EV sector. The incoming EV tide is altering the shape of the shoreline, but the movement of the sand is so limited and so gradual that it’s difficult to spot with the naked eye. Amidst news that Volvo will “electrify” its entire lineup by 2020, that BMW will offer a bevy of EVs by 2025, that Nissan will sell twice as many new Leafs as old Leafs, that the Chevrolet Bolt just outsold the Chevrolet Volt, reside these cold, hard facts. Even with EV sales doubling between 2013 and 2017, only 1 out of every 200 U.S. new vehicle acquisitions involves an electric vehicle. Plug-in hybrids are comparably popular, hybrids generate four times more volume, and diesel-powered vehicles — excluding full-size pickups — achieve EV-like volume despite their Volkswagen extermination, as well. Buying habits will change. But they will change very slowly. global: LAST in (electro-)ecology? ...with-or-without regulations? A U.K.-based emissions testing company that has tested more than 500 vehicles in the U.S. since 2013 says it's found no discernible improvement in overall fuel economy and no decrease in CO² emissions, a key greenhouse gas. That's despite a wide range of newer engine technologies and improvements like turbocharging, stop-start systems, lightweight materials and eco-drive settings. Emissions Analytics tells Automotive News (subscription required) there's a difference between lab testing and real-world performance, and that not all of these technologies help in the latter. The company plans to release its full findings on U.S. vehicles in early October. Researchers measured carbon monoxide (CO) and dioxide (CO²); nitric oxide (NO) and nitrogen dioxide (NO²); oxides of nitrogen; total hydrocarbons; particulates; fuel economy; and fuel consumption. They used a portable emissions measurement system strapped like a bike rack to the back of vehicles, which they drove over an 88-mile course on public roads in Southern California. 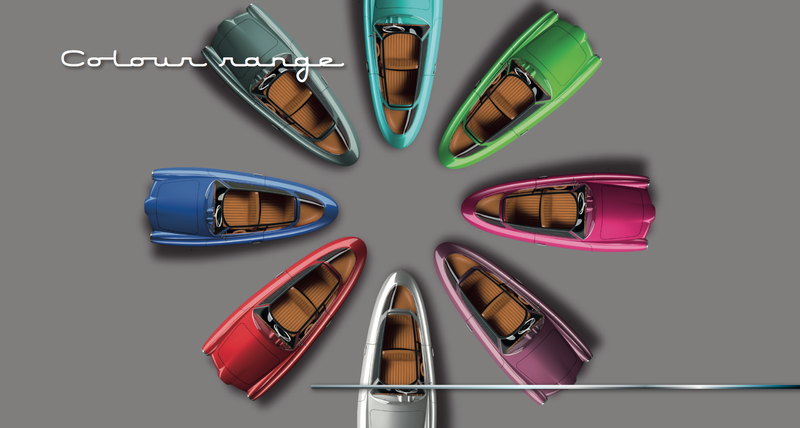 • Vehicles with engines smaller than 2 liters have essentially posted no change in fuel economy. Meanwhile, the fuel economy of engines between 2 and 3 liters, the most common, dropped by 8 percent, and fuel economy rose by 8 percent in engines of 3 liters or larger. The drop in economy for the most common engine class is problematic for overall CO² emissions in an era of cheap gasoline, when Americans are commuting longer distances but small-car sales are lagging. • While the EPA's five-cycle test procedure tracks pretty closely with EA's real-world tests, automakers may be relying too heavily on "off cycle" credits given by the EPA for technologies like engine stop-start systems and "eco" driving modes that cut fuel consumption. Those systems aren't accounted for in the driving tests. That said, it's only logical that a car sitting at idle gets zero miles per gallon, while one that's turned off by a stop-start system is by definition economical. • Turbocharged engines show large gaps between lab and real-world use, delivering big fuel savings when under low stress but becoming far less efficient once the turbos are engaged. In other words, these systems are driven with a light during testing, but real-world drivers engage the turbocharger far more often. • Regular hybrids, which have gotten lost in the hype over plug-in hybrids and pure EVs, are among the best technologies in delivering fuel economy and cutting greenhouse gases. The study's findings seem intriguing, even controversial. And though the study itself won't be published until next month, it sounds like one safe conclusion goes something like this: These technologies can yield better economy and curb noxious emissions, but in the real world, some are less effective than others. And a big piece of the equation is us — how economically we drive. The technology won't make up for a lead foot. NO MORE EXCUSES, FLINCMOCO ! Last week we saw Bosch reveal its "e-axle" off-the-shelf" electric powertain solution for automakers who don't have the means or inclination to develop their own. Now another company is doing something similar. 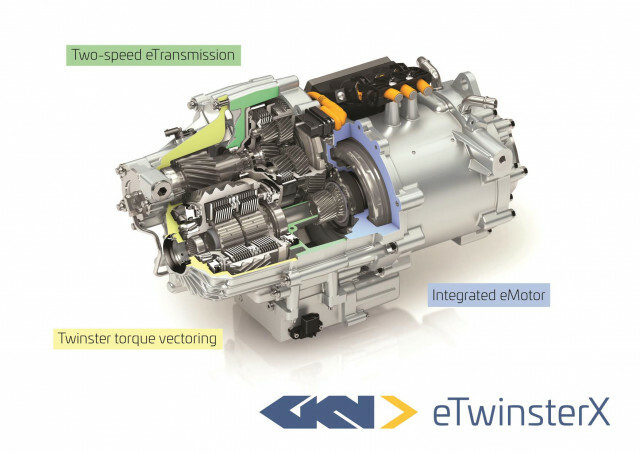 GKN Driveline, a leading supplier of automotive drivelines and technologies, introduced the "eTwinsterX" at the Frankfurt auto show. The eTwinsterX is an integrated electric drive unit designed to serve as primary source of power or as a secondary powertrain system in a hybrid application. 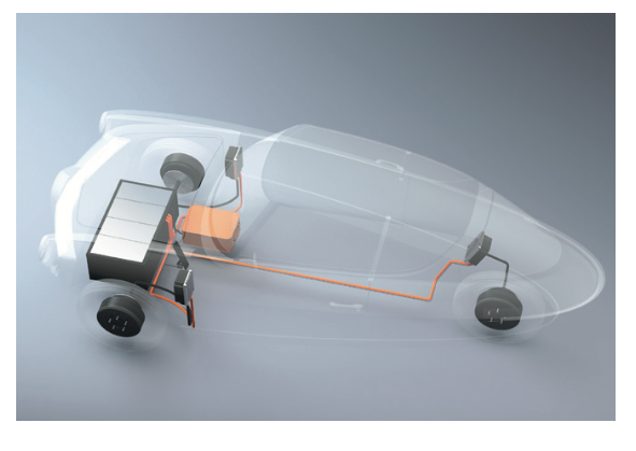 GKN provides electric-drive units for Porsche, Volvo, and BMW, among others. GKN says its unit is significantly smaller than systems with equivalent power outputs, and that size makes it adaptable to a number of chassis configurations and vehicle types. The company says it will work in rear-, front-, and all-wheel-drive setups. In fact, GKN says it is the first eAxle with full off-road capability. The eTwinsterX uses a two-speed transmission. This provides more balance between acceleration and top speed as compared to a single-speed setup. Additionally, the eTwinsterX can vector its torque output between the driven wheels. Imagine snagging a chassis from Williams, an eAxle from Bosch or GKN, and a battery from Tesla. You could start your own EV company. 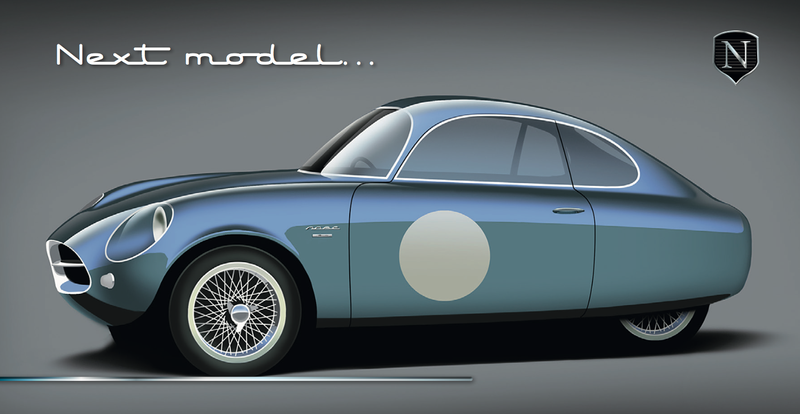 I get emails about concepts and proposals and grand automotive schemes all the time. It’s pretty rare that any of them actually come to fruition. But I was sent one that, while still very much non-existent, was charming and interesting enough that I want to show it to all of you. It’s called NOBE (the website doesn’t seem to work yet), it’s Estonian, and just look at the **** thing. I’m a sucker for weird old microcars and retro designs, so this thing is pretty much just a thirst trap tailor-made to rope me in. Whatever; it worked. I think the design for this is absolutely lovely, and if they can somehow maintain the look in a production model (I’m told a physical prototype is about to be built), I’ll be thrilled. ...The three-wheel design also gives me some hope for the car, because three wheels means that it could, hypothetically, come to the U.S. and be free from all those crash-testing rules that we all know it won’t pass. The one good thing Elio has done is paved the way for three-wheeled cars to be legal in most states, so that lack of a fourth wheel is actually what makes this actually plausible for sale in America. 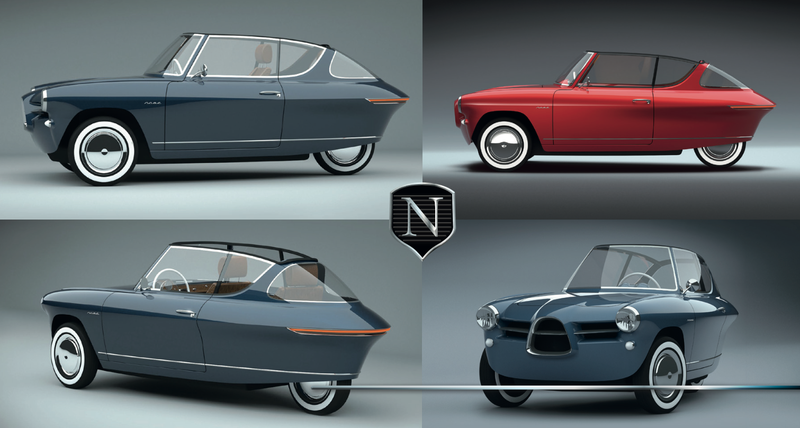 The proposed specs on the NOBE are that its electric, making a maximum 45 kW, or 60 horsepower, which seems pretty substantial for something like this. That 60 hp seems to be spread over three motors, I suppose each making 20 hp? The range is targeted at 160 km, or 100 miles, which, again, would be very good; that’s about on par with what current Nissan Leafs get, and, trust me, you’d much rather be seen in one of these. Technically, it’s an interesting three-wheeler because it’s all-wheel drive; I guess it’d be a 3x3? I’d only seen that on specialized ATVs, so it’s interesting to see it proposed here. What’s most interesting to me is an innovation you can see in that diagram to the right there. The main battery is that big box up front, but look right behind it, in the passenger’s footwell—see that little beige box? That’s a battery, too. This briefcase-mounted battery is designed to be easily removed and taken from the car for recharging. It acts as a supplemental auxiliary battery, either providing power for auxiliary systems or providing up to 40 km (24 miles) of additional range. I think this is a fantastic solution for how to deal with the still-very-inadequate charging infrastructure. Even if you have nowhere to charge your car at your office or home or a friend’s place or whatever, it’s a great way to be sure you can at least get an extra 20 miles of range to get home or wherever. Now, this is all just a concept, but based on some other work I’d done involving the idea of removable batteries, I think such a battery, with about 20-25 miles of range, could weigh about 40 lbs. Maybe less, since the demands of the NOBE are not as much as what I was looking at. That’s definitely more on the luggable side, but it is possible. The NOBE people also described a plan to me about a way to tow the car with a normal, full-sized car to charge it up. Like, you’d tow it like a trailer to a big city, park the full-size car outside the city, and use your charming little electric three-wheeler in the dense metropolis, all charged up from the drive. I have no idea if this project is likely to happen or not, but I’m rooting for it. The team is made up of people from Estonian racing car companies like RSMotorsport and RaceTech, so there appears to at least be some practical experience behind these charming ideas. I was also told by email that these guys have mortgaged their homes to get this off the ground, so they seem to have some skin in the game, too. Getting into the car business is tough no matter what, and who knows what will happen? What I do know is that this is an appealing concept, with at least one actual new idea that feels promising. I’d love to see some of these things buzzing around, looking all lovely and colorful, and watching their happy owners’ arms twitch and strain as they lug little leather suitcases full of batteries into coffee shops and offices. Best of luck, you crazy Estonians. I want to drive that prototype when you get it done! Never heard or read anything about this project. global: First in (Electro-)Ecology? ...getting drafted? WASHINGTON — Former EPA official Margo Oge says the auto industry needs "an adult" to help sort out differences over the federal greenhouse gas program and boldly reaffirm automakers' commitment to stricter emissions standards. She's got someone in mind. "We need a real leader in the industry to stand up," said Oge, who helped broker the 2011 deal between the Obama administration and the auto industry that envisioned doubling fleetwide average fuel economy to 54.5 mpg by the 2025 model year. "And given the politics right now, it has to be a Detroit company. The one I see shaping this dialogue is Bill Ford." Oge told Automotive News she wants to see the executive chairman of Ford Motor Co., a longtime environmental advocate, "stand up and help California and the federal government negotiate any flexibilities for 2025 and set the road map for 2030." "I believe if he does that, we will see the investor community respond with a stock price increase in Ford," Oge said, "because investors are looking for companies that are not behaving like the traditional OEMs with competition from Silicon Valley, Tesla and China." Automakers this year successfully pushed the Trump administration to reopen the midterm review of 2022-25 model year greenhouse gas standards, arguing that Obama administration officials rushed to lock them in without considering whether initial assumptions about compliance costs and fuel prices — and their effect on consumer demand for cleaner vehicles — panned out. As part of its review, the EPA held a public hearing here Sept. 6 and has opened up the 2022-25 standards, as well as those for 2021, to public comment. That 45-day comment period expires Oct. 5. But the industry's effort is self-destructive and will ultimately fail, Oge said, because there is wide recognition that the program is working. Manufacturers "would do much better if they walk the talk that they are building cool, clean and smart cars," she said. "In the end, the markets will reward those that unequivocally embrace the future, not ones who keep sending out mixed messages." Oge — the former director of the EPA's Office of Transportation and Air Quality and author of the book Driving the Future: Combating Climate Change with Cleaner, Smarter, Cars — criticized automakers for giving in to fears among their less progressive competitors that complying with ​ upcoming corporate average fuel economy and greenhouse gas standards would be too costly. She blamed the Alliance of Automobile Manufacturers for instigating industry backsliding on the standards, but predicted that legal challenges, as well as automakers' need to keep up with rising emissions standards in California other countries, will keep the industry on track. "It is in the alliance's self-interest to keep everyone believing that this is a fight they can win," she said. In crafting the 2011 agreement and the standards that were finalized in 2012, Oge recalled, U.S. officials met one-on-one with engineers rather than bring companies to group discussions, which would have stifled sharing of confidential technical data by competitors. Engineers had to prove to the government's technical experts their claims that certain efficiency improvements were unattainable. "The alliance represents the lowest common denominator, so you don't have the dynamics and the trust we had when setting the standards," said Oge, an engineer who worked at the EPA for more than 30 years until 2012. The EPA faces an April 2018 deadline to determine whether to affirm the existing rules or start a new rule-making process to modify them. Fourteen states and environmental groups are expected to sue the administration if the standards are rolled back. Oge said she is confident courts will rule to sustain the existing program because it is successful and the January determination was based on extensive technical analysis in accordance with the agreement. The industry wants the government to account for the rising cost of fuel- saving technology and the impact on the affordability of cleaner vehicles. Oge said the CAFE and carbon emissions program could be adjusted in positive ways that give the industry some of the relief it's seeking without undermining the goals of the program or throwing automakers' investment plans into disarray. For example, she suggested not counting upstream greenhouse gas emissions for electric vehicles — that is, the environmental impact of producing the electricity that powers them — "because EVs are a new technology and car companies should not be held responsible for emissions coming from the energy sector." She also recommended more government incentives for EVs. But there is no leadership within the White House to bring together the EPA, the Transportation Department, California air-quality regulators and the industry, she lamented. That's where Bill Ford could play a key role, she said. "It will take an adult in the car industry to stand up and I'd like Bill Ford to do that," said Oge, noting that former Ford CEO Alan Mulally was "big in helping us set the standards in 2012." This year's executive shake-up at Ford Motor Co. returned Bill Ford to an operational role in overseeing external communications and government relations. Spokespeople for the Auto Alliance and Ford Motor Co. pointed out that CEOs from 18 automakers signed the Feb. 10 letter to President Donald Trump requesting that the administration reopen the midterm review. "We have consistently supported everyone working together to further reduce greenhouse gas emissions while keeping transportation affordable. And we have been an advocate for keeping California at the table as future standards are reviewed," Ford Motor Co. said in a statement to Automotive News. The Auto Alliance said a robust midterm review is consistent with the spirit of the 2011 agreement. Said Gloria Bergquist, a spokeswoman for the alliance: "We feel strongly that we signed up to these ambitious targets in the future knowing they were built upon many assumptions, knowing we would have a midterm review to check those assumptions against reality." Last edited by 2b2; 09-25-2017 at 07:46 PM. 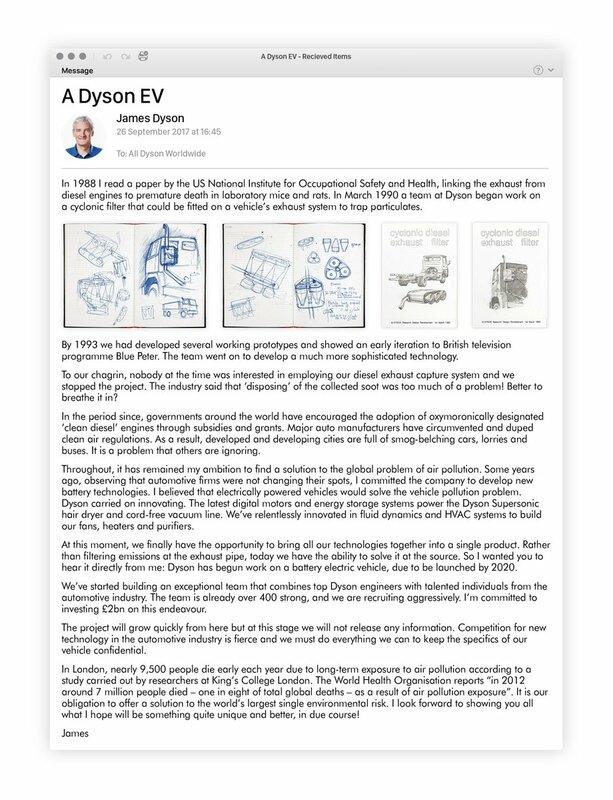 ...Olya Leptoukh, Communications Manager at Dyson, said the company has invested billions of pounds into motors, batteries and other core technologies since 1990. Every body is building electric vehicles on these days... is so easy? global: First in (Electro-)Ecology? ...in spending? Last edited by 2b2; 09-28-2017 at 10:35 PM.